Following a passion for truth in storytelling, Hilary graduated from the University of Western Ontario in 1998 with a Bachelor of Arts in Film and then from Sheridan College with a post-graduate diploma in Journalism. After graduation, Hilary took a full-time position with the sales team at Labatt Breweries of Canada. She fell in love with corporate sales, enjoying the relationships she formed with her clients. She was quickly recognized for her outstanding communication and interpersonal skills and was elevated to the position of Territorial Manager for the Kitchener-Waterloo area. She excelled in this role, winning Top Sales Representative in Ontario for 2007. After eight fulfilling years, she decided to leave the corporate world in order to nurture, guide and cherish her two daughters. Though she treasured the time with her children, it took only four weeks for Hilary to realize how much she missed the daily interaction with clients and colleagues. After some deliberation, and acknowledging her aptitude both with people and with a camera, she launched a family portrait photography business. In December 2008, One for the Wall Photography was established. Photography became Hilary’s new storytelling tool, allowing her to weave tales of individuality and relationships through impactful imagery. With her keen business skills and passion for outstanding client service, One for the Wall quickly flourished into a successful full-time enterprise and continues to become stronger with each passing season. In the last ten years, Hilary has been privileged to photograph over 3,000 families. In 2011, she began to branch her business into commercial and corporate photography, creating imagery for promotional and marketing purposes, as well as executive and professional profile portraits. Hilary has quickly become known in the thriving local business community as the first choice for both natural light and studio light photography. Alongside her corporate work, she has also created a strong portfolio of actors, singers, speakers and other arts and entertainment professionals, who are drawn to her dramatic lighting and creative composition. A proud supporter of the arts, Hilary works with KW Glee, making the amazing young singers feel like the rock stars they are, with creative headshots, concert stills and backstage action shots. Hilary is also the official photographer for Drayton Entertainment in Cambridge, Ontario. She photographs each show for archival purposes and to provide images for promotional and media distribution. For the past three years, Hilary has poured her boundless energy into creating an annual series of images for the Waterloo Region Down Syndrome Society. Her projects ’31 Days, 31 Faces’, ‘See Me’, ‘Better with You’ and ‘Who do You Love?’ have been featured by local and national media, spotlighting these wonderful children and adults and their families and their beautiful and unique perspectives on the world. Her commitment to social change through photography is also reflected in her most recent photo series ‘Boxed’, a collaboration with photojournalist Hannah Yoon that brings attention to transgender and non-binary youths in the KW region. Hilary was awarded the Rogers K-W Oktoberfest Woman of the Year in the Arts for 2018. In May 2014, she was awarded Photographer of the Year by the National Association of Professional Child Photographers (NAPCP), earning one of her winning images a place on a Times Square billboard in New York City. She has received international acclaim for her colourful and emotion-filled work, having images that have been selected in the Rangefinder Portrait Competition 2017, VOICE Collection 2015 + 2016 and the National Association of Professional Child Photographers’ International Image Competition. Hilary has become a respected entrepreneurial educator sharing her passion for photography and enterprise, offering individualized Business Mentoring to photographers throughout Canada and the US. She also offers photography courses for kids sponsored by Nikon Canada, who provided cameras for the children to use during the course. She is committed to giving children a positive first experience in the world of photography and to inspiring and valuing their unique eye for the world around them. Hilary loves living in the dynamic community of Waterloo Region and is proud to share her passion for entrepreneurism, volunteerism and community involvement with her two beautiful girls, while being wonderfully supported by her husband of seventeen years. We look forward to our annual photoshoots with Hilary. The photoshoots leave us feeling like we have just had a wonderful family experience and a visit with a treasured family friend and the end result is beautiful snapshots of our family that are treasured parts of our story. Not to mention, the photographs always solicit many compliments and “who does your photos” from family and friends. Shoots with young families/children can not be easy but Hilary is phenomenal and works with each family member to get the perfect shot. Hilary is patient, kind and has oodles of tricks up her sleeves to get even the toughest toddler to crack. Hilary is one of most versatile professionals I have ever met. 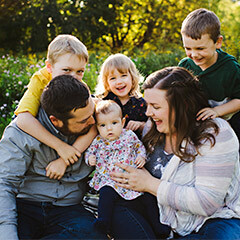 Her skill set varies from being an asset in my professional shoots – and the only person I would have visually represent my business – to my family photos where she can bring out the personalities in my kids and make them laugh and shine! Her personality, energy, attitude, creativity and absolutely breathtaking photos are bookmarks in time with my family of which I will always treasure and be grateful for! She is always leading the trends in photography- and creating images that are always so beautiful! We are so grateful to have you for every big milestone in our life – and couldn’t recommend you more! Hilary has been our family photographer for almost 9 years now. We instantly fell in love with her work and wanted to make sure she captured the growth of our family on an annual basis. Together, Hilary and I would play around with the seasons, lighting, outfits and location. But year after year, Hilary worked her magic. These photos have made appearances in our photo books, Christmas cards and canvases collages on our wall. Hilary is wonderful with the kids. Her kindness is inviting and they feel comfortable with her. Consequently, she is able to capture relaxed and fun poses that reflect their uniqueness. Hilary has been photographing my family for over seven years. Her talent, keen eye, professionalism, kindness, and generosity of giving back to her community through her craft, are beyond comparison. She has a knack for making photography sessions fun and enjoyable, and her uncanny way of working with children inevitably elicits big smiles from them. She has taught us all to feel comfortable and confident in front of the camera, and to recognize the importance of including ourselves as parents in the photos with our children. Hilary’s photographs of our family have become our most precious and cherished keepsakes and will be for years to come. We love Hilary! For 8+ years, starting three weeks after the birth of our first child, Hilary has been there to capture the timeline of our family. Her photos can steal your breath and evoke tears of joy. Her ability to capture the individual personality (human or animal!) of her subjects is legendary, the results are priceless. Regardless of the setting, Hilary’s photos show the true beauty of her subjects. She can herd kids that won’t stop running and be there to capture that one second where they go still. Our annual photo shoot is an event looked forward to by everyone, every year, anticipated only second to getting the actual photos; followed by the agonizing negotiations to settle on a reasonable number of final images. Hilary plays a vital part in the history of our family and hopefully continues to for many years to come!